Here is yet another example of Iranian medicine officials spelling out the problems and causes of the current medicine crisis in Iran. 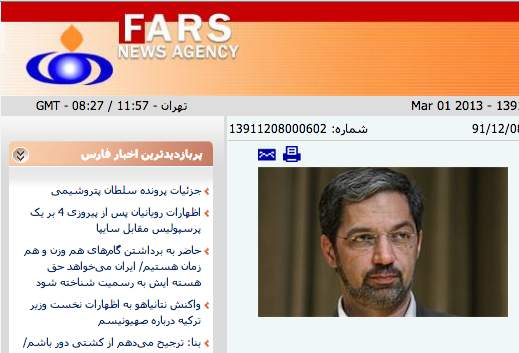 Mehdi Mohamadzadeh, Head of Iran's Association of Pharmaceutical Medicine Economics in an interview with the official Fars News Agency said "Of course we are in a dire economic situation, but with regards to medicine, there are no sanctions against us and the world's large pharmaceuticals are not reluctant to sell medicine to us. They are willing to co-operate, so long as they get paid"
Mohamadzadeh who is also a member of the Medical Sciences Scientific Committee at Beheshti University added "The cause of the crisis is that either very little government rate currency is allocated or it is paid late." Mohamadzadeh's statements are in tune with what the rest of Iranian medicine officials, including the former Health Minister, Marzieh Dastjerdi, have said repeatedly. "Medicine crisis in Iran is nothing to do with sanctions" as former Health Minister kept saying before she was sacked by Ahmadinejad. All the officials who are involved in the medicine import to Iran have been pinpointing the problem at medicine import companies, not receiving the allocated government rate currency to import the drugs with. The government rate currency is instead used to import luxury cars and non-essential goods like horse saddles, cosmetics and spade handles. Yet if you just google for "Medicine Crisis in Iran", you will see sensational headline after headline on how people are dying in Iran as a result of sanctions. There is just an unbound amount of unfounded and uncorroborated material in the Western media on how sanctions are killing Iranians by denying them vital medicines and yet the people in Iran know who is to blame and the officials involved in Iran's pharmaceutical industry have said the medicine crisis is nothing to do with sanctions. Iranian regime lobbyists are hard at work in the West however. They are trying to influence the media, the think tanks, the peaceniks and policy forums and sell a story to the world which has nothing to do with the facts on the ground. Gary Sick's cronies and paid lobbyists made sure I couldn't disseminate what was being said by Iranian pharmaceutical officials and media to the G2K mailing lists. The aim is to suppress the truth and appeal to the useful idiots around the world, people with good intentions who are short on facts. Why the Islamic Republic is not giving priority to importing medicine can be summed up in one sentence "the sick don't riot". Interesting to read the haemophiliac nomadic Luri boy in Khuzestan died of lack of blood for transfusion. Iran has an excellent record for blood collections, particularly at times of national crises, eg earthquakes. There is no shortage that requires imports. The case probably has more to do with a poorly run hospital and the failure to cater for a transient ethnic population that is not particularly respected by the metropolitan elite. excellent post. thank you for providing clarity on this contentious issue, with regard to which many people have significantly incorrect misconceptions.